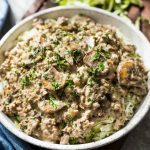 Creamy low carb beef stroganoff made with ground beef, mushrooms, and onions, in a tasty sour cream sauce flavored with brandy, herbs, and spice. Gather ingredients. Cook cabbage or cauliflower rice and keep warm. Slice mushrooms and onions. Heat a medium-large pan over medium heat until hot. Add 2 tbsp butter and swirl to coat. Add the mushrooms and spread evenly in the pan. Leave to cook for 2 minutes (or until browned) then turn them over, cooking for another 1 1/2. Push the mushrooms to the sides of the pan and add the remaining tbsp of butter to the middle of the pan with the onions and saute until softened. Remove the mushrooms and onions from the pan. Cook the ground beef in the pan, breaking it up into small pieces, until just cooked through. Add the brandy, beef base, and Worcestershire sauce, stirring well. Scrape the mushroom mixture (and any accumulated liquid) back into the pan with the ground beef, sprinkle the nutmeg over the top and let some of the liquid simmer off. Add the cream cheese, stirring to melt. Stir in the sour cream and simmer gently until thickened. Stir in the parsley. Salt and pepper to taste. Serve over cooked cabbage noodles or cooked cauliflower rice. Serves 4. The beef stroganoff is 4.6 g net carbs per serving on its own. Served over cabbage noodles it's 8.3 g net carbs. Served over cauliflower rice it's 7.87 g net carbs. If you have a higher carb tolerance, this low carb stroganoff is delicious over cooked spaghetti squash.